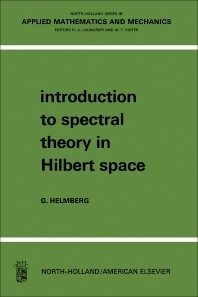 North-Holland Series in Applied Mathematics and Mechanics, Volume 6: Introduction to Spectral Theory in Hilbert Space focuses on the mechanics, principles, and approaches involved in spectral theory in Hilbert space. The publication first elaborates on the concept and specific geometry of Hilbert space and bounded linear operators. Discussions focus on projection and adjoint operators, bilinear forms, bounded linear mappings, isomorphisms, orthogonal subspaces, base, subspaces, finite dimensional Euclidean space, and normed linear spaces. The text then takes a look at the general theory of linear operators and spectral analysis of compact linear operators, including spectral decomposition of a compact selfadjoint operator, weakly convergent sequences, spectrum of a compact linear operator, and eigenvalues of a linear operator. The manuscript ponders on the spectral analysis of bounded linear operators and unbounded selfadjoint operators. Topics include spectral decomposition of an unbounded selfadjoint operator and bounded normal operator, functions of a unitary operator, step functions of a bounded selfadjoint operator, polynomials in a bounded operator, and order relation for bounded selfadjoint operators. The publication is a valuable source of data for mathematicians and researchers interested in spectral theory in Hilbert space.